The Extasis trio will be performing one night only at the Center for the Arts at Kayenta, on March 22 at 7:30 p.m. Audiences will thrill at the gorgeous sounds of this rich, vibrant musical culture -- the musicians play flawlessly and passionately. Tickets are $30 and can be purchased at the Center's website. Learn more about the professional musicians below! Born in Colorado, Evan Orman studied cello at the North Carolina School of the Arts, the Banff Centre in Canada, and the New England Conservatory. His teachers include Colin Carr, Eleanor Shoenfeld and Robert Marsh. He has performed in master classes for Yo Yo Ma, Janos Starker and the Guarneri Quartet and has worked closely with violinist Louis Krasner and composer Iannis Xenakis. An enthusiast of Argentine tango, Evan Orman has studied tango music and the bandoneón (a type of concertina) in Buenos Aires (through a grant from Tango Colorado) and plays the bandonéon in his Denver-based group, Extasis. His interest in the bandoneón, and in the music of Astor Piazzolla (the Argentine bandoneónista and composer), prompted him to acquire his first instrument in 1996. He has studied with Raul Jaurena of the New York Tango Trio and in Buenos Aires with Camillo Ferrero of Orquesta El Arranque. In addition, Extasis has coached with bassist Pablo Aslan (also of the New York Tango Trio). 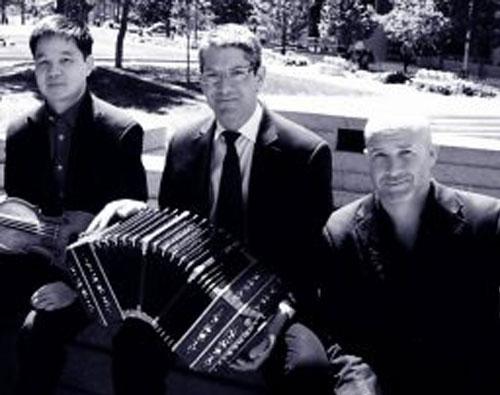 On bandoneón, Mr. Orman has performed as soloist with the Camerata San Antonio, Cellisimo (a group comprised of cellists from the Colorado Symphony), the Colorado Symphony Orchestra, the University of Colorado Symphony Orchestra, the Chicago Chamber Musicians, Virtuosi Chicago Chamber Orchestra, and the Columbus, Georgia Symphony Orchestra. Along with Extasis violinist, Claude Sim, he has performed with the band Devotchka on several occasions. He performs on two bandoneóns: an Alfred Arnold, ca. 1935 and a modern instrument by Carlfelder Bandoneón and Concertina Fabrik (AA) that was made in 2011. In addition to his musical activities, Evan has been successful as a maker and restorer of bows for stringed instruments and currently maintains a shop in Denver. He is a member of the American Federation of Violin and Bow Makers. Michael Tilley is an Assistant Professor and Musical Administrator for the Lyric Theatre Department at the University of Illinois. Before accepting this position at the University, he served as Musical Director for Franc D’Ambrosio’s national tours. In this position, he has performed, arranged, orchestrated, co-written, and produced hundreds of concerts throughout the country. In addition, as a conductor, he has led ensembles from Central City Opera, Opera Colorado, Emerald City Opera, and Boulder Opera, as well as several benefit concerts in New York City and elsewhere. He has been a featured performer with the Colorado Symphony Orchestra and many regional orchestras, and also the Martha Graham Dance Company at the Vail International Dance Festival. His orchestrations and arrangements, from solo piano to full symphony to musical theater to rock opera have been performed in America, Europe, and Africa. He has also composed music for the stage and a feature-length soundtrack. He plays, arranges, composes and sometimes even sings for the Argentine Tango groups Extasis and Orquesta Tipica di Natural Tango. Claude Sim is currently Associate Concertmaster of the Colorado Symphony. Since joining the orchestra in 1999, he has performed as violin soloist under the batons of Marin Alsop, Stefan Sanderling, and Jayce Ogren among others. He previously held a principal violin position with the Baltimore Symphony, and has served as guest Concertmaster with the Kansas City Symphony. Other guest affiliations include the National Arts Centre Orchestra in Ottawa and the Philadelphia Orchestra. As a chamber musician, Mr. Sim has concertized as guest first violinist with the Miró Quartet, as well as guest violist with the Pacifica Quartet. He has collaborated with members of the Tokyo and Vermeer Quartets, and with noted pianists Jeffrey Kahane and Christopher O’Riley. He also performs with the Argentine Tango group Extasis.